A Solarmax ll, 60, BF 15, H-alpha scope was mounted on an iOptron Cube Pro, AZ, GOTO mount. A DMK 21AU.AS camera was placed at the prime focus. Four overlapping regions were imaged using Nicola Mackin's AstroDMx Capture for Linux, on a Linux Mint laptop. The exposure was set to capture the disk and 1000 frame SER files were captured. The exposure was changed to capture the prominences and again, 4 x 1000 frame SER files were captured. The SER files were Stacked in Autostakkert! 2 in Wine, and the resulting 16 bit Tiff files were wavelet processed in Registax 5.1 in Wine. The four panes from each exposure were combined in Autostitch in Wine. The resulting two images were post processed and combined in the Gimp 2.9. Click on the image to get a closer view. A ZWOASI120MC CMOS camera with a x2 Barlow lens, was used with a Windows 32 bit netbook and Sharpcap to capture a 1000 frame 16 bit SER file with a region of interest around a prominence area of 640 x 480. The SER file was stacked in Autostakkert!2. 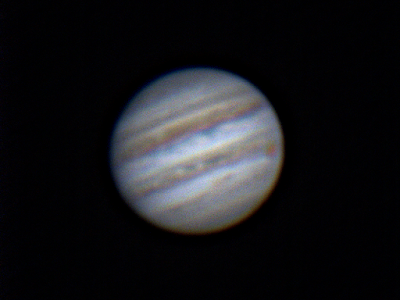 The resulting image was wavelet processed in Registax 5.1 and post processed in the Gimp 2.9. The ZWO will soon be implemented under Linux in AstroDMx Capture for Linux. Celestron 9.25 SCT AVX, ZWO ASI120MC-S camera, 5008 images captured in Firecapture, 50% stacked and aligned in AutoStakkert!2.3, wavelets in Registax 6, then edited in Adobe Elements 11.